Hi everyone! My name is Sharon Ojala. 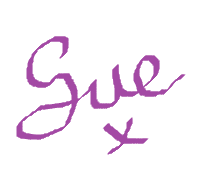 This is my first time to be a guest blogger so I would like to first start with a big thank you to Sue for the invitation! I'm a 42 year old single mom of two boys and one girl. 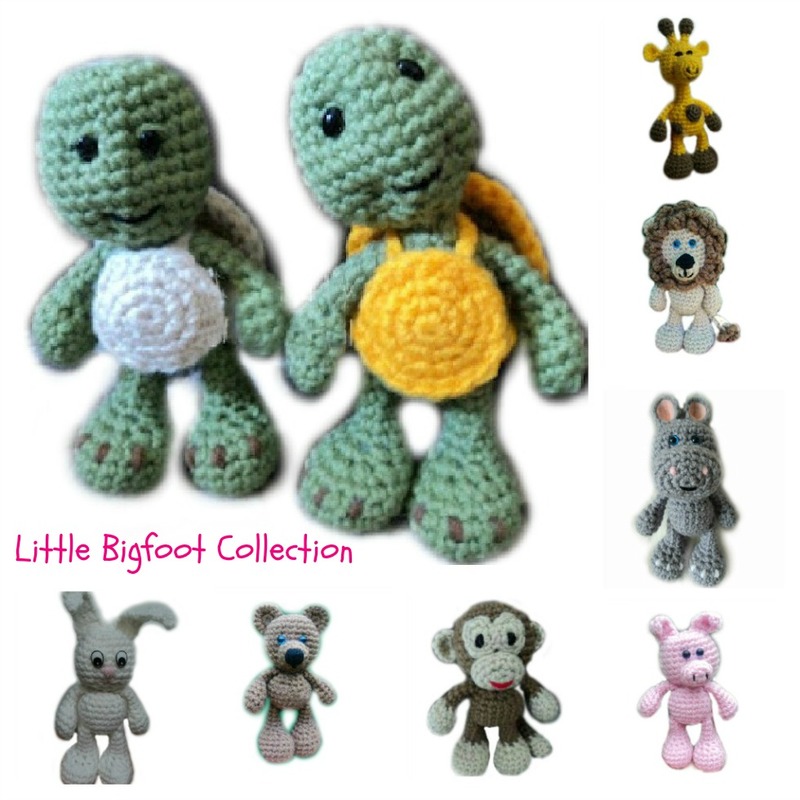 I ventured into the world of crafts and crochet just as a way to make my children gifts and it was also a great way to fill up the time I had at night when my children were sleeping. I began to craft so much and it became such a huge part of my life that I needed an outlet to share my ideas and projects so in 2010 I started with a blog called Homemade Obsessions and there I posted a little bit of everything that I was making from dollhouses to crocheted toys. 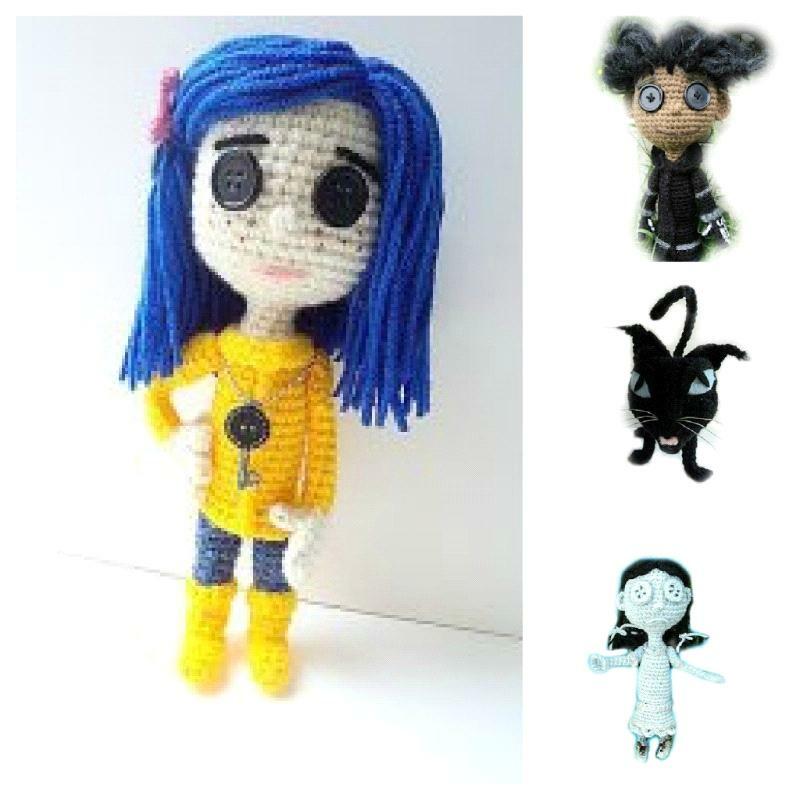 Once my facebook page took off and my blog was getting a lot of traffic I decided to separate my craft projects from my amigurumi projects and opened up another blog called Amigurumi To Go. This was a good decision. The blogs are now more user friendly and with projects and patterns separated everything is much easier to find. On Homemade Obsessions you will find mostly dollhouse projects and whatever crafty thing I'm making at the moment. 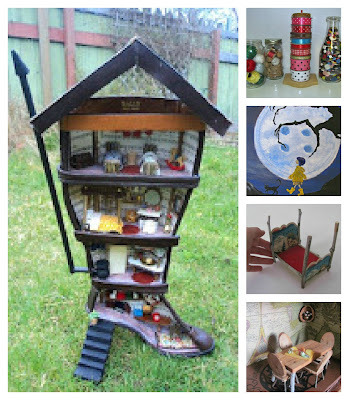 Pictured below are just a few of my projects from a pair of vintage leather boots turned dollhouse to a Coraline collage painting using acrylic paint and layers of paper. Most of these projects are shown in photo tutorials. I also have a facebook page for dollhouses as well. 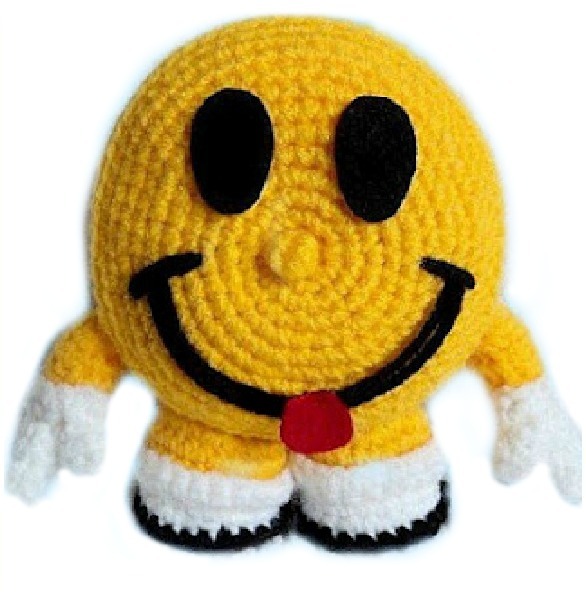 It's not as active as my crochet page but it's still a good page and I also have a good bunch of resource links there too so stop by and check it out. 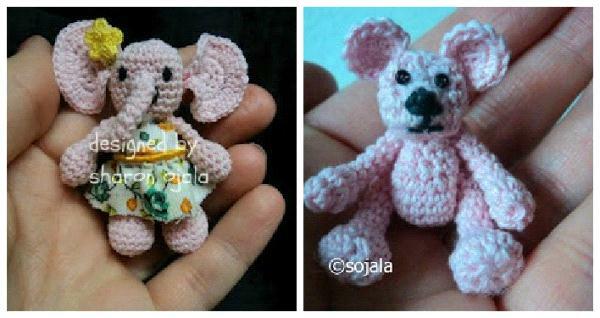 I am beginning to combine crochet and miniatures together so there will be crocheted miniatures to see in 2013! Many of my designs came from a desire to make characters based on my family's favorite movies or tv shows. This is where the inspiration came to make Coraline, she was the first character doll I designed and then shortly after I designed the other characters from that movie. All these patterns are free. 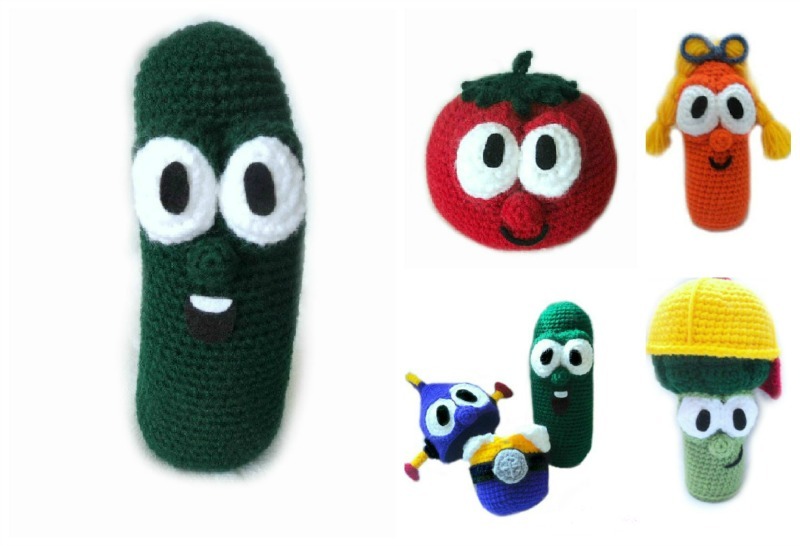 Who doesn't love the Veggie Tales! I made these for my little boy as Christmas gifts in 2011. They were a huge hit with my son and the patterns are pretty popular too and all free! Right now I have a new series in the making inspired by the movie Totoro! 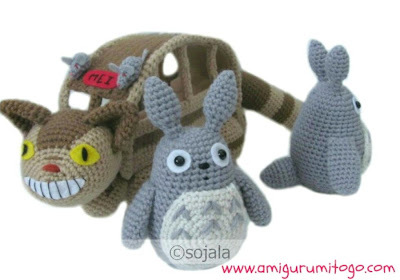 The Cat Bus pattern is available and he has seats inside which means there will be passengers soon, join me on twitter for pattern updates as they become available. I also designed the Little Bigfoot Collection which has become very popular for people just starting out in amigurumi. A few of these also have video tutorials to go with the written patterns. There are more animals in this series coming! So I guess that covers what I'm blogging these days. But there's more! You can also find me on pinterest where I pin free patterns from a variety of designers. I personally check each pin for spam , patterns are in categories and I also do my best to link directly to the pattern itself. I am also on Ravelry and my personal facebook page is here, I'm always happy to add new friends! I just love your designs! Please say thank you to Sharon and visit his sites! Love Sharon and her designs! Her sites have been a gateway for meeting up with many other fabulous crocheters and lovers of yarn arts (and miniatures)! So glad to see her get some well-deserved exposure here for all she has done for the crafting community!